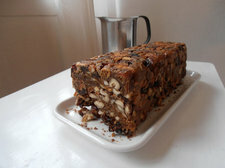 Any suggestions on where to find a good local fruitcake? Yep, we hear the joke already: A good fruitcake is no fruitcake. But apparently good version of the Christmas staple are actually pretty good. We'll also expand Bryon's question a bit to include other traditional Christmas cake-ish things, like stollen. So, got a suggestion for a good local place to snag a fruitcake? Please share! And a sentence or two about why you're recommending the place/product is always appreciated. Earlier on AOA: Bakeries that sell yule logs/BÃ»che de NoÃ«l for Christmas? Where is a good fruitcake near Albany? My snowbird sister wants some. Please post a bakery and/or recipe!! I haven't found a good commercial fruitcake. My family makes it every year, and it's delicious, but mainly because we use dried fruit instead of the candied fruit, and add more nuts. If you're making it at home, that's the best bet. I think the main reason why fruitcake is considered so bad is because people don't really like the candied fruit - it looks gross and artificial and has very little flavor other than sweet. Correction, I think the nuns bake the cakes. Either way, they are fantastic.